However, just before they split for good, word comes down that the gang of Frank Miller (Ian McDonald) recently came to town, and their recently freed chief will soon arrive. Kane knows they have one objective: to settle the score with him. 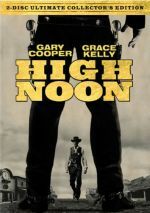 High Noon appears in an aspect ratio of approximately 1.33:1 on this single-sided, double-layered DVD; due to those dimensions, the image has not been enhanced for 16X9 televisions. This was a spectacular transfer. At all times, the movie boasted excellent definition. Sharpness consistently looked tight and concise, as virtually no instances of softness marred the presentation. Jagged edges and shimmering remained absent, and only minimal edge haloes cropped up around some high contrast items. Source flaws were also essentially a non-factor. I detected a handful of tiny specks, these were too small and too infrequent to become even a mild distraction. Blacks looked terrific. Those elements appeared deep and dense, while contrast also succeeded . The movie featured pure whites and created a marked and clean distinction among the light and dark aspects of the image. Shadow detail was smooth and concise as well. Even with the smattering of specks and the light edge haloes, I was too impressed by this transfer to give it a grade below an “A”. It presented a remarkable image given its age. Although this DVD provided an “enhanced original restored audio” Dolby Digital 4.1 soundtrack, this really came across as glorified monaural. The disc also included a remastered version of the original mono mix, and I flipped between the two at times. I noticed virtually no differences between them, as I felt they sounded identical. And that was fine, since the mixes held up fine over the last 56 years. Speech was a little tinny at times, but the lines usually sounded fairly natural when I factored in the era in which they were recorded. To be sure, all dialogue remained easily intelligible at all times, and I noticed no edginess or other problems. Effects fell into the same range, as they showed perfectly decent replication. These elements were reasonably clean and full, and they lacked any noticeable flaws. A little light background hiss created the only source defects, so the track was usually clean. Nothing here dazzled, but the audio satisfied. 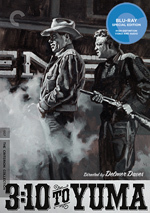 This 2008 “Ultimate Collector’s Edition” of High Noon offered the third DVD iteration of the film. We also got releases in 1998 and in 2002. Both of those earlier releases offered very similar audio. I thought their transfers demonstrated different strengths and weaknesses, but both were flawed and earned “C-“ grades. How did this “UCE” compare to those earlier releases? It topped the two in both categories. Visual quality marked the biggest improvements. Virtually everything about this transfer looked better than its predecessors, and not in a minor way, so the UCE’s image blew away that of the earlier discs. Audio improvements seemed less significant, but I still felt they existed. The new track showed greater clarity and fewer flaws. While not the same “night and day” difference seen via the image, the cleaned-up soundtrack appeared to mark a step up in quality. Perhaps the best scenes to demonstrate the improvements come when Amy visits Helen. In the prior DVDs, those sections were a bit of a mess, but here they showed no problems and fit the rest of the transfer just fine. Really, this was a remarkable reproduction of such an old film, and it made its predecessors look terrible by comparison. In terms of extras, this two-disc UCE takes everything from the 2002 Collector’s Edition and adds a few new components. I’ll mark exclusive components with an asterisk, so if you fail to see a star, the element appeared on the 2002 release. On DVD One, we encounter an audio commentary with the children of some of the film’s principal participants. This track includes remarks from Maria Cooper-Janis, Jonathan Foreman, John Ritter and Tim Zinnemann. Although the commentary’s producers try desperately to make us believe that all four participants sat together, that clearly wasn’t the case. Instead, Ritter and Zinnemann formed one tandem, while Cooper-Janis and Foreman watched the film together in a separate session. The producers combine the remarks to create the illusion of one big group, but it doesn’t work, and the result seems annoying and distracting. Unfortunately, the content of the commentary doesn’t offer enough good material to overcome those flaws. The Cooper-Janis/Foreman pair dominates the piece, but they offer little useful material. Occasionally they chime in with something moderately informative, but mostly they simply describe the action and tell us how great everything is. On the other hand, Foreman/Ritter give us some reasonably compelling notes about their fathers’ work, but they appear infrequently during the track. Lots of dead air comes along for the ride. These factors render the whole program mediocre at best and frustrating most of the time. DVD One opens with some ads. We get promos for 3:10 to Yuma, Hamburger Hill and Reservoir Dogs. You can find these in the Also From Lionsgate area as well. Over on DVD Two, we find The Making of High Noon. Hosted by Leonard Maltin, this 1992 program lasts 22 minutes and 10 seconds and offers a nice overview of the movie and its era. We find then-contemporary interviews with producer Stanley Kramer, director Fred Zinnemann, and actor Lloyd Bridges plus David Crosby (son of cinematographer Floyd) and John Ritter. It also includes some snippets from a late Fifties TV interview with Gary Cooper. We also get a documentary called Behind High Noon. Hosted by Maria Cooper-Janis, the nine-minute and 45-second piece includes comments from Tim Zinnemann, Jonathan Foreman, and Prince Albert of Monaco, Grace Kelly’s son. Some of the material seems redundant after the prior program, but it manages to contribute a few decent facts. Cooper-Janis’s exceedingly stiff narration weighs it down, however, and ultimately “Behind” seems like a pleasant but not terribly valuable program. For something new, we head to the 49-minute and 56-second Inside High Noon. Created in 2006, it presents notes from Cooper-Janis, Foreman, Tim Zinnemann, Prince Albert, President Bill Clinton, Fordham University’s Meir Ribalow, Virginia Tech’s Stephen Prince, Princeton University’s Lee Clark Mitchell, and Western Films author Brian Garfield. “Inside” looks at the film’s lasting societal impact and legacy, some interpretation of characters and themes, the project’s origins and development, casting and performances, rewrites and how the story reflected its era, cinematography, characters and storytelling, changes to the original script, and general production thoughts. Unlike “Making”, “Inside” mostly focuses on themes and interpretation. In that regard, it does pretty well. At times it meanders, but it usually provides good insight into the flick’s underbelly. Expect to get a nice take on the tale here. Next we discover a radio broadcast that features singer Tex Ritter on The Ralph Emery Show. The five-minute and 35-second piece includes remarks about Ritter’s career in general as well as his involvement in High Noon. It seems somewhat flat, but it offers a nice little historical document. *Tex Ritter: A Visit to Carthage, Texas fills five minutes, 56 seconds. In it, we find notes from Texas Country Music Hall of Fame/Tex Ritter Museum president Tommie Ritter Smith. She tells us a little about Tex and leads us around the museum. It’s not particularly substantial, but it gives us some decent thoughts about the singer. More from the singer pops up via *Tex Ritter Performs the Oscar-Winning Theme Song on The Jimmy Dean Show. The two-minute and 53-second clip provides a pretty ordinary affair; Ritter croons in front of a Western-style stage set. Ritter emotes more for this take on the song, so it lacks the grittiness of the studio version. Nonetheless, it’s a nice archival piece. Frankly, High Noon is such a solid movie that I'd endorse the DVD without any supplements; the extras qualify as gravy. The film holds up well after more than 50 years and stands as a strong piece of dramatic storytelling that also features a powerful social connection. The DVD itself displays excellent picture quality plus decent audio and a reasonably good roster of extras. High Noon is a classic that belongs in all film libraries. And this “Ultimate Collector’s Edition” is the DVD to own. That goes for new viewers as well as those who possess either of the prior discs. The UCE presents audio similar to its predecessors and doesn’t add anything amazing in terms of extras, but it provides picture quality that blows away the prior releases. That issue alone makes this a must-have DVD.